This document describes how to use Groonga CloudSearch step by step. The goal of this document is that you understand how to use Amazon CloudSearch compatible API and you can develop your application with Groonga CloudSearch. You don’t need Amazon CloudSearch API related knowledge. This document describes it. This document doesn’t describe Amazon CloudSearch specific topics such as how to start Amazon CloudSearch service and how much payment will be caused for your application. See Amazon CloudSearch page about them. Groonga CloudSearch is an Amazon CloudSearch compatible open source full text search server. Groonga CloudSearch provides Amazon CloudSearch compatible API. You don’t need to pay any fee, register any sites and buy a new server to use Groonga CloudSearch. You can try Amazon CloudSearch compatible API on your computer and develop your application that uses Amazon CloudSearch API. You will get your Amazon CloudSearch API on your computer after this tutorial. This tutorial describes how to search documents and how to register documents. First, searching is described because you will be interested in searching rather than registering. 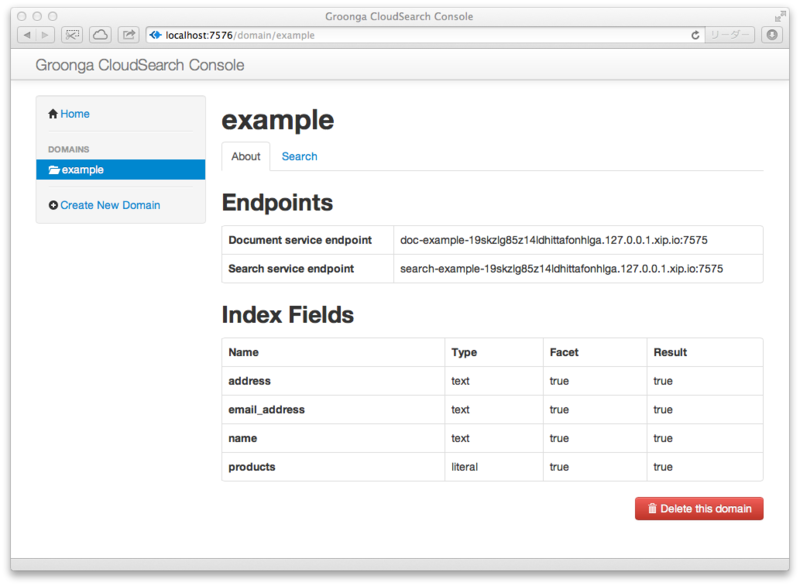 Searching is described with example documents provided by Groonga CloudSearch. So you don’t need to care about registering. It is described later. This section describes how to prepare your environment to do this tutorial. In this tutorial, Mac OS X is used but you can also use Ubuntu 12.04 LTS or CentOS 6. 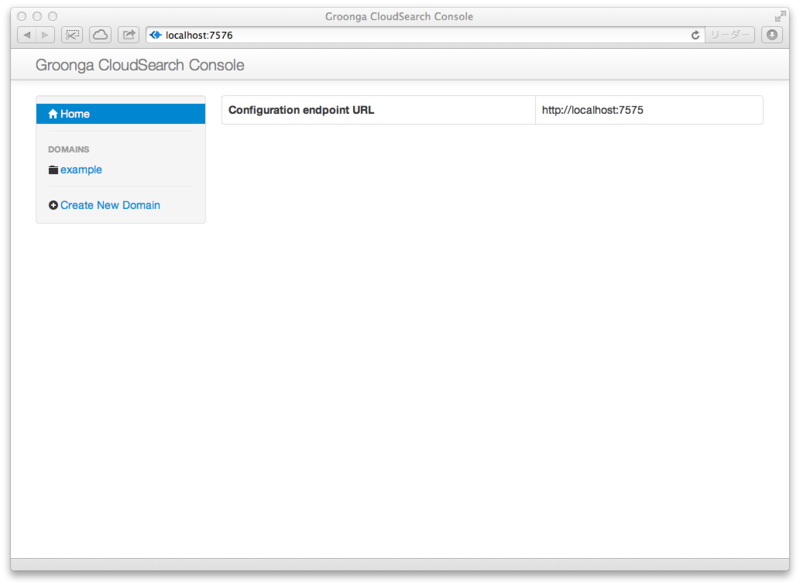 Install Groonga CloudSearch. Install describes how to install Groonga CloudSearch. Amazon CloudSearch API groups search target documents. Each group is searched separately. The group is called as search domain. Search domain is corresponding table in RDBMS. A search domain has documents like a table in RDBMS has records. In this tutorial, example is used as the sample search domain name. DOMAIN_NAME is search domain name. DOMAIN_ID is search domain ID. BASE_DOMAIN_NAME can be an arbitrary name as long as we can reach the Groonga CloudSearch server via the endpoints. In this situation, xip.io is useful, which is a magic domain name that provides wildcard DNS. Of course, we can use localhost as BASE_DOMAIN_NAME, for example. If you do so, you need to setup these endpoints in /etc/hosts. In this tutorial, we just use xip.io for simplicity. We use the domain whose name is example in this tutorial. Groonga CloudSearch server listens at http://localhost:7575/ by default. You’ll configure behaviours of the server via command line options. See the help document ( gcs --help ). If you are running the server as a service, then you have to modify the configuration file /etc/default/gcs instead of command line options. Hit enter to start importing. If you need some action before start importing, you will see the instructions like the screenshot below. Follow the instructions and run gcs-import-examples-http again. When you hit the enter key, import will be started. OK. Test environment is prepared. Let’s try search API. The endpoints for the domain example are automatically generated as follows. Simple search API is used for searching documents. You also try searching with Groonga CloudSearch Console, which provides the administrative Web user interface. 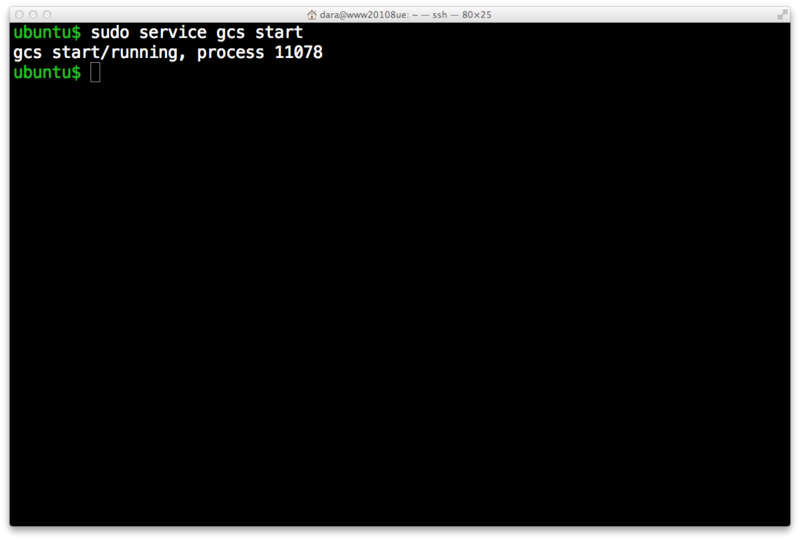 Consult the Install document and setup gcs-console package. Now, start Groonga CloudSearch Console. Make sure that Groonga CloudSearch server is also running. Groonga CloudSearch console communicate with Groonga CloudSearch server via HTTP, with Amazon CloudSearch compatible APIs. After Groonga CloudSearch console started, open http://localhost:7576/. You will see available domains on the server. Choose example domain. Domain details are shown. Input tokyo to text field and press Search button! You will get documents that have tokyo keyword in content. There is the API URL corresponding to the query in the search page. 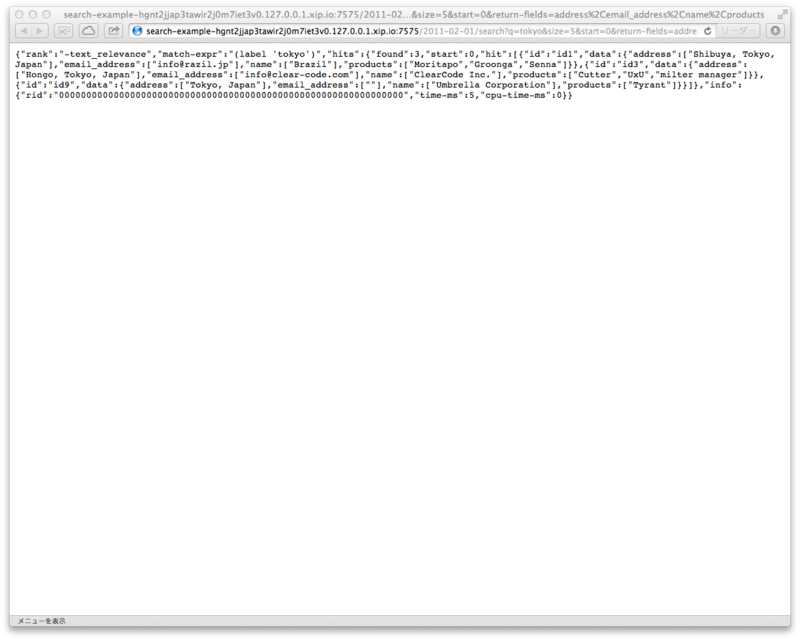 To see raw response body in JSON, open the API URL. The API URL just has q parameter. q parameter means that searching documents that have query string (q parameter value) in the default search fields. The default search fields are all text fields by default. See Search Response - Amazon CloudSearch for returned JSON format. Groonga CloudSearch doesn’t support sorted and/or restricted facets for now. Such features will be supported in the future release. See also: Search Requests - Amazon CloudSearch for all parameters. The above section describes how to search documents. The below sections describe how to register your documents. You need to create search domain and text fields before registering documents. Groonga CloudSearch includes some command line tools to do it. This section describes how to create a search domain by those commands. 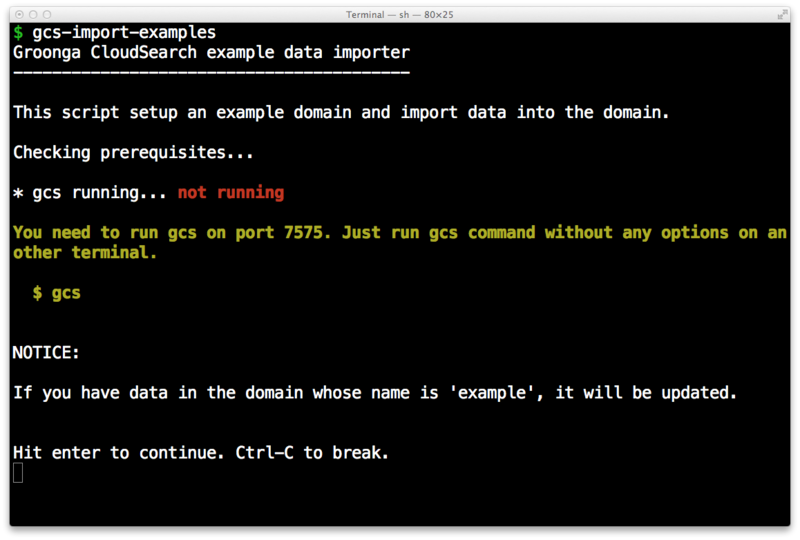 Groonga CloudSearch’s command line tools are named as “gcs-…”, and they are compatible to Amazon CloudSearch’s “cs-…” commands. 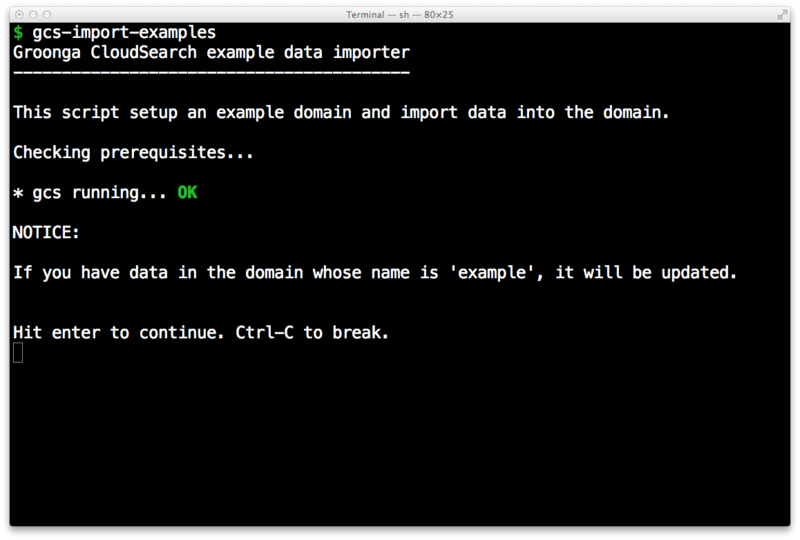 See also: Amazon CloudSearch Command Line Tool Reference - Amazon CloudSearch. There are two large differences between cs-commands and gcs-commands. First, Amazon’s cs-commands require authentication but gcs-commands don’t implement it yet. You can omit authentication related parameters. See also: Running the Amazon CloudSearch Commands - Amazon CloudSearch for details. If you omit the option, gcs-commands will work for localhost:7575. By default the privileged IP range is “127.0.0.0/8”, so you can configure the service only from the computer itself. By the way, the gcs-import-example command is written as a shell script with these gcs-commands. 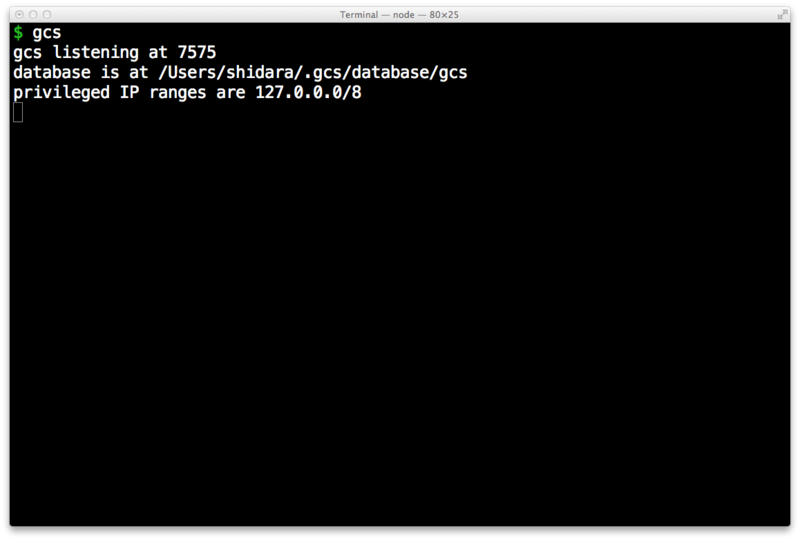 To create a new search domain, use gcs-create-domain command. It requires --domain-name parameter to specify a new search domain name to be created. See also: cs-create-domain - Amazon CloudSearch for details. To define a new index field for the search domain, use gcs-configure-fields command. It requires three parameters: --domain-name the search domain name, --name a new index field name to be defined, and --type a type of the field. See also: cs-configure-fields - Amazon CloudSearch for details. 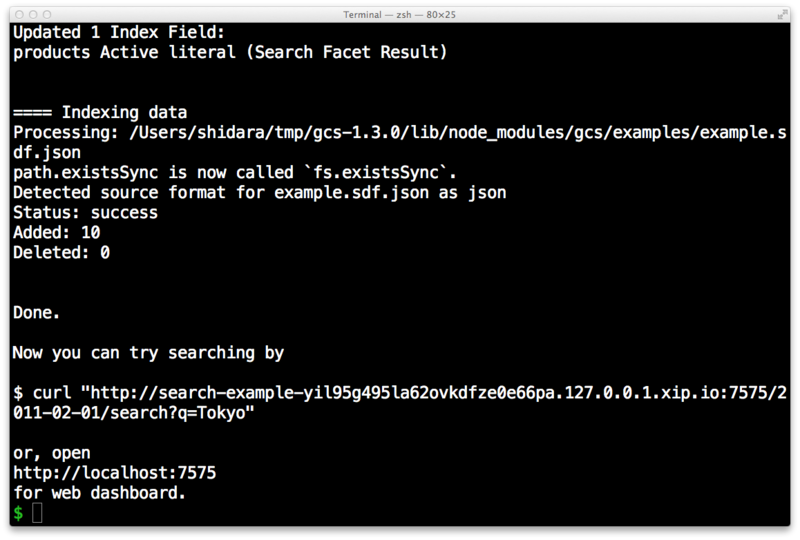 See also: documents/batch JSON API - Amazon CloudSearch for details of SDF JSON representation. See also: cs-post-sdf - Amazon CloudSearch for details. Now, you can search registered documents! Yay! You can configure search domains and register documents, by not only gcs-commands but also APIs via HTTP. Configuration API is the interface to configure search domains via HTTP. This section describes how to create a search domain by the API. Configuration API requires Action parameter and Version parameter. Version parameter must be 2011-02-01 for all configuration API. See also: Amazon CloudSearch Configuration API Reference - Amazon CloudSearch. Configuration API requires authentication but Groonga CloudSearch doesn’t implement it yet. You can omit authentication related parameters. See also: Request Authentication - Amazon CloudSearch for details. By the way, the gcs-import-example-http command is written as a shell script with these APIs. To create a new search domain, CreateDomain is specified as Action parameter. CreateDomain action requires DomainName parameter. Its value must be a new search domain name to be created. See also: CreateDomain - Amazon CloudSearch for details. To define a new index field for the search domain, DefineIndexField is specified as Action parameter. DefineIndexField action requires DomainName parameter and IndexField.IndexFieldName parameter. DomainName parameter value must be the target search domain name. IndexField.IndexFieldName value must be a new index field name to be defined. See also: DefineIndexField - Amazon CloudSearch for details. See also: documents/batch JSON API - Amazon CloudSearch for details of response. Join our Community and share your requests, problems and so on! See also FAQ to learn more about Groonga CloudSearch. 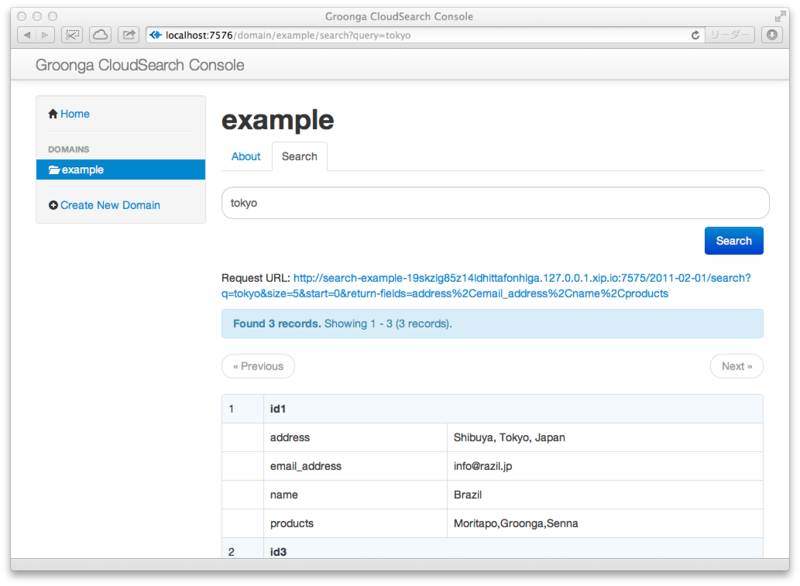 Groonga CloudSearch is released under the MIT License.